Tariah offeres herself up to cancel her father's debt and save her family. 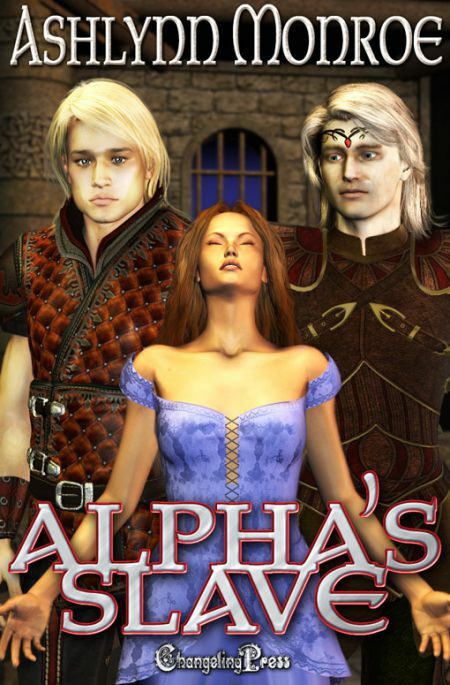 She assumes she'll be executed, but when bonded warriors Zerion and Arwyn give her the choice between life with them or death she chooses to live. Now Tariah must search deep inside herself for the bravery required to mate with two Psy Warriors whom she both fears and desires. "I liked the story... Readers who enjoy a good vampire style paranormal should give this one a try." "Stay quiet," Tariah whispered. "They'll go past us." Hiding was a gamble, but running promised loss. Four horses ambled past as their riders skillfully navigated the clutter of fallen logs and brush. Tariah could see them, but prayed they couldn't see her. Thunder rumbled in the distance and the wooden refuge trembled with its power. The few tendrils of light died as the storm chased away the sun. Above the sky was almost as black as night. She shivered with the cold and her wet dress clung to her skin. Even with her sister's combined body heat she had to bite her lip to keep her teeth from chattering and giving away their location. Holding her breath, Tariah waited. Her sister's trembling body and terrified eyes kept her strong. She couldn't panic or they'd be lost to the demons. A horse snorted near their hiding place. Sandrea's thin body jerked. Tariah held her close while willing her to remain still and quiet. They were so close to salvation. The last rider needed to move out. She could taste freedom. When it was safe, she'd take Sandrea and leave the village. Her father was a cruel man. He'd never forgive this dishonor. Life would be hard, but they'd be alive and together. The horse moved on. Tariah let out the breath she'd been unconsciously holding. Sandrea grinned, but then a flash of panic filled her expression. A small sneeze erupted from Sandrea's tiny nose. Fear gripped Tariah's heart. Gods save us and send the demons of our ancestors to protect us. If the gods were kind, the rider would be far enough away such a tiny sound would be lost in the noise of the horses. She closed her eyes and held her breath. Pain radiated through Tariah as large hands reached into the tree to grab her. A scream tore from her and she fought. Sandrea's eyes brimmed with tears. "I'm sorry," she sobbed. Somehow the soft words managed to reach Tariah as the warrior ripped her from her sister's side. "Let us go!" Tariah shrieked as she struggled with every ounce of strength she possessed. He held her so tight she couldn't draw a full breath. "Stop!" growled a commanding male voice. She stilled. When the brute let go, Tariah glazed up at the biggest alpha male she'd ever seen. The man had golden eyes and the telltale eight-pointed star of a Psy Warrior. Her breath caught in her throat. His blond hair, darkened from the mist, framed a masculine, yet beautiful, face. Terror made her pulse race. He'd kill her for running. His hand reached out and she flinched. Tariah's eyes fluttered closed in anticipation of the blow. "A true warrior would never strike an unarmed innocent. I never harm the weak." Tariah's eyes opened. His kind was so much more glorious than any human could hope to be. There were women who sacrificed themselves happily just to be near such males. Her mouth went dry, but then her brain restarted. "Never underestimate your prisoners." She whispered the first rule of the greatest tome on war written by the Psy. His eyes widened. Tariah kicked the brute holding her between his legs. The man released her as he dropped to his knees like a stone. Her hair hung heavy and limp from the moisture and tangled in her face. She pushed the wet strands back so she could see. Before the massive warrior could recover from his agony, she grabbed her sister's hand and they started running. Sandrea didn't complain about her leg this time. Terror outweighed pain. Absolute panic kept them moving. The sound of their labored breathing and the swish of foliage roared in Tariah's ears. She kept one arm out to push the branches and brambles away and her other hand held her sister as they ran heedlessly through the forest. A thorn slashed her cheek. A moment later, the warrior had them. Tariah screamed as she was lifted, midstep, into the air. A different rider seized Sandrea off her feet. Sandrea flailed her arms, shrieking, and weeping as he pulled her up and over his horse. "Let her go! Don't hurt her," Tariah screamed. She feared for her sister even as the warrior who possessed her dangled her precariously over the ground. If he lost his grip, she'd fall and most likely die. The warrior pulled her into his lap, just as the seam of her dress ripped and the fabric immodestly slipped off her shoulder. The warrior held her tighter. "Lose your fear, woman. I won't harm you." His deep voice made her shiver. "How old are you?" She didn't want to respond, but something indefinable compelled her to. "Nineteen harvests this year." She glanced over at her sister and a lump formed in her throat as she watched another warrior pull Sandrea's small, thin body up onto the huge beast he rode. "Hold her tight!" Tariah ordered. "I will kill you if she's harmed." The male holding her sister glanced over and gazed at Tariah with wide eyes and a slack jaw. The startled male gawked at her while her captor erupted in booming laughter. His loud amusement sent a flock of birds roosting in the branches overhead airborne. Sandrea's captor situated her firmly on the horse. Tariah closed her eyes. The scent of the man holding her filled her with the strangest yearning. Each step of the beast under them shook Tariah and she found herself gripping the arm holding her as the powerful horses returned them far too quickly. Tariah bit her lip and inhaled deeply. When she opened her eyes her father and the village men stood in a line, waiting. Pure outrage tightened her father's features. Her people were farmers. If it came to a battle they'd be decimated by their mystical overlords. Evelia stood in the doorway of the cottage. She held the other girls back, using her body as a blockade. Tears dripped from her cheeks. Unspoken goodbye haunted her sister and dearest friend's sweet face. Tariah's heart broke. This is not good. The chill in the air matched the cold she felt inside. Her soul was frozen. Today is the day I die. The group of warriors halted before her father and the armed villagers. The man holding Tariah slid off his mount, taking her with him and depositing her on her feet. A small gasp escaped her and betrayed her fear. The warrior's grip was firm, but he wasn't hurting her. She tried to struggle out of his grip, but he didn't release her. When her father approached, he raised his hand to hit her. She turned her head to the side and closed her eyes. Her muscles were tight, her whole body anticipating the blow. The man grabbed her angry sire's arm before his hand could make contact with her face. "Do not harm what is mine," rumbled the massive male. Tariah glanced up in surprise and realized he was the one with the scar she'd seen earlier. His stance was protective as he shielded her.